TMe:Marvel Comics to lose rights to Captain America? According to a news story reported by AnotherUniverse.com, comic book artist Joe Simon might be attempting to reclaim the copyright to Captain America. 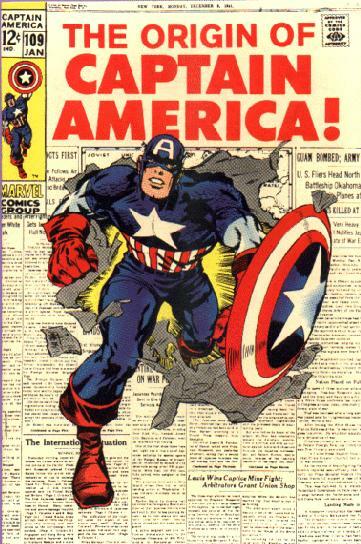 Captain America, owned by Marvel Comics, made his first appearance in 1940 reaching a high point of one million copies sold per month and has since become a national icon, as well as, a core symbol of the Marvel Entertainment Group. Simon, who co-created the character with the now deceased Jack "King" Kirby is seeking transfer of the copyrights. According to Simon's lawyers, termination notices have been filed in the U.S. Copyright Office. Ross Charap, an attorney involved in this case said that creators of material copyrighted before 1978 are permitted to take back their creations for up to 39 years of what is now a copyright term of 95 years. What this means is that Marvel has been given notices of termination in which Simon will recapture the copyright effective December 7th, 2001. Back in September, Joanne Siegel (widow of Joe Siegel) made a similar move against DC comics in a bid to retake the copyrights of another comic book icon -- Superman. While Simon had supposedly been contemplating a move to regain the rights to his creation, it was action take by the Siegel family which finally helped him decide on his present course. Marvel might defend themselves against Simon's claim stating that Jack Kirby, who later became an employee of Marvel for many years, signed away any claims he might have had to his creations during the sixties/seventies (including Captain America) and since he had been involved in the creation of this character, copyright belongs to them. Simon's attorney claims that while Kirby had input into the origin, it was Simon who came up with the idea of Captain America in which Kirby took on the penciling chores after the character had been brought to the Timely Studios. (Timely later became Marvel). Simon states in the first ten issues of Captain America, Kirby was only involved as a penciller and that he alone had sole creative input. This is not to take away from Kirby's abilities, who Simon has the utmost respect for, just that he (Simon) came up with all the characters of the stories including Bucky and the Red Skull. Simon stated in a past interview that the character was designed by he and Timely publisher, Martin Goodman. Kirby was given the scripts and layouts but before Kirby ever saw the first page, Captain America's costume had already been designed. There's even hard evidence of an original sketch of Captain America, which was clearly drawn by Simon. Simon contends that he changed the original triangular shield to a circular design due to the close resemblance it beared to the a competitor's character called "The Shield." Neither Marvel Comics nor the Kirby family have yet to make any public statements regarding these recent events. It is well known in the industry that Marvel mistreated Kirby as they refused to return his original art for decades. It would be highly unlikely that the Kirby's would rally in support of Marvel against Simon's claim. Only the following weeks and months ahead will tell. Thanks to AnotherUniverse.com and Matt Brady for the scoop.